Symposium on The Bible and Creation | ComeSeeTv Broadcast Network ... Can you See me Now! 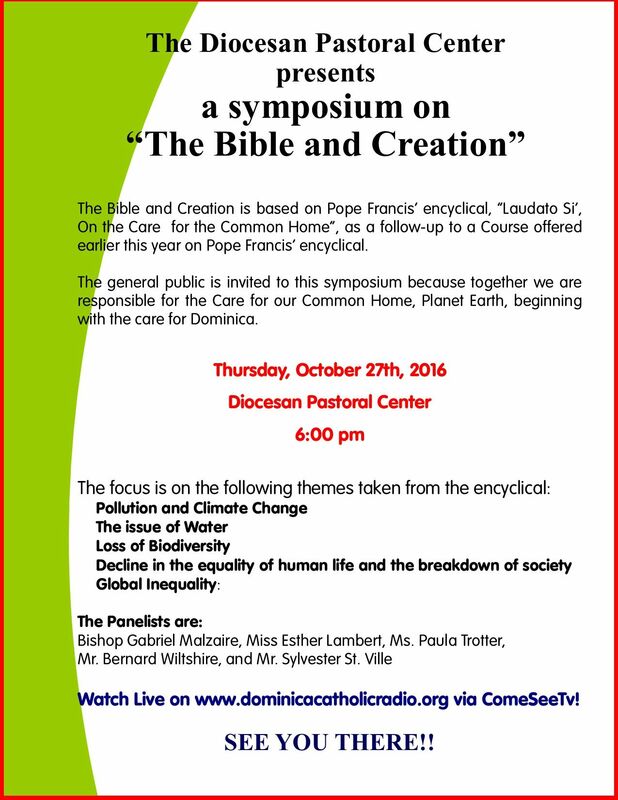 SYMPOSIUM “BIBLE AND CREATION” BASED ON POPE FRANCIS’ ENCYCLICAL LAUDATO SI, ON THE CARE FOR OUR COMMON HOME. In January this year, the Pastoral Center offered a Course on Pope Francis’ Encyclical, Laudato Si, on Care for our Common Home. This course generated a great deal of enthusiasm and meaningful, insightful discussion. At the end of the course, the participants felt that the discussion on climate change and the imperative of each of us recognizing our responsibility to care for our common home, planet Earth should be continued. They also felt that such an important document deserved a larger audience. They saw the need of creating awareness on the part of all our citizens and formulating plans and suggesting concrete activities in as a way of responding to the plea of Pope Francis. This was the genesis of the idea of a Symposium on the subject. This Symposium entitled “The Bible and Creation- A Symposium on Laudato Si’ on Care for our Common Home” will be held at the Diocesan Pastoral Center on Sunday, January 15th, 2017 beginning at 6:00 pm.